There’s no denying it now, we’re squarely into October, and fall foods! Don’t forget to pick up your special shares and Lewis Waite orders as well. To see complete info for vegetables in the box this week, check out Golden Earthworm’s weekly newsletter. They also have info up there about a special CSA day on their farm on Sunday, October 14th. The list below is most of what will be in the box this week, but items are subject to change. Pickups are from 5-8pm at Sunnyside Community Services this Thursday. The fruit share this week includes Empire and Gala apples. 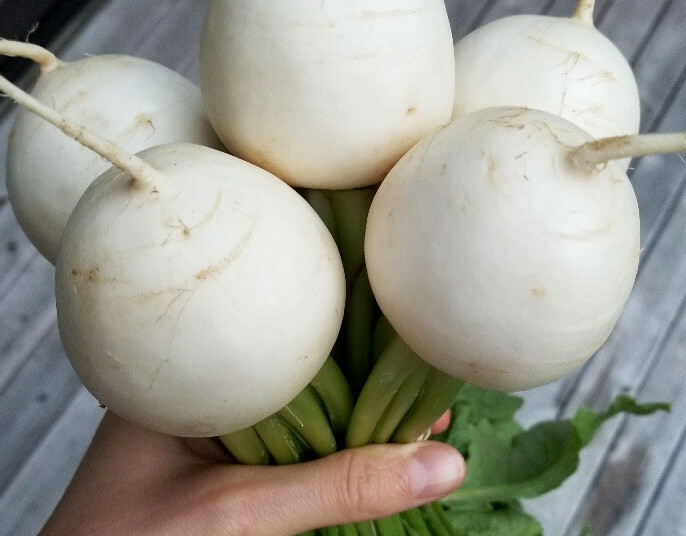 Japanese Salad Turnips – Don’t forget to eat the greens AND the roots. Separate the greens from the roots before storing. Store in an airtight storage in the fridge. Use in 3 days. Bok Choi – A member favorite, year after year. Store in an airtight storage in the fridge. Use in 3 days. Red Radishes – Radishes are spicy when they grow in hot weather. These are mellowing out, but there are some spicy ones in there. Delicious roasted. Separate the greens from the roots before storing (leaves can be eaten). Store in an airtight storage in the fridge. Use in 3 days. Collards – A southern green that works well in many kale recipes. Just remember that collards need to be cooked long enough so that they become tender. Store in an airtight storage in the fridge. Use in 5 days. Napa Cabbage – This cabbage variety has a great crunch and the frilly leaves are tender. Makes great salads or stir-fries. Store in an airtight storage in the fridge. Use in 10 days. Acorn Squash – Another round of these yummy squash from our organic farm partner in Mass. Store on the counter. Use in 5 days. Butternut Squash – Also from our farming partner up north. Store on the counter. Use in 5 days. Please note that any boxes not picked up by 8pm will be donated to SCS. Look for Golden Earthworm Organic Farm CSA on Facebook for more recipes from members!